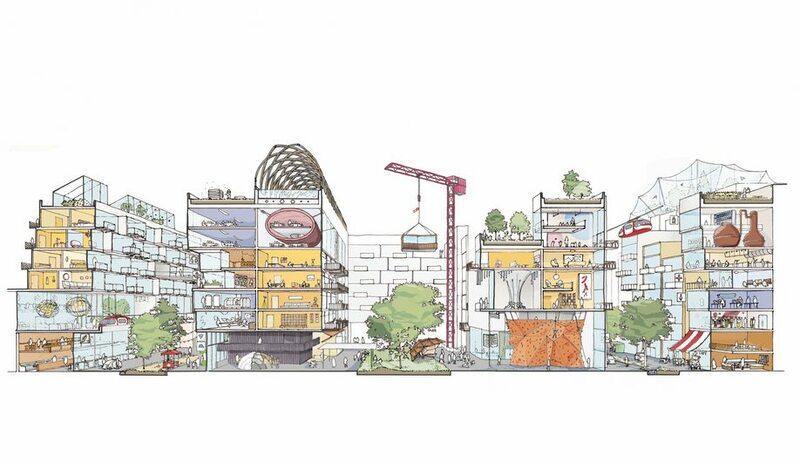 A rendering from Sidewalk Lab’s presentation. 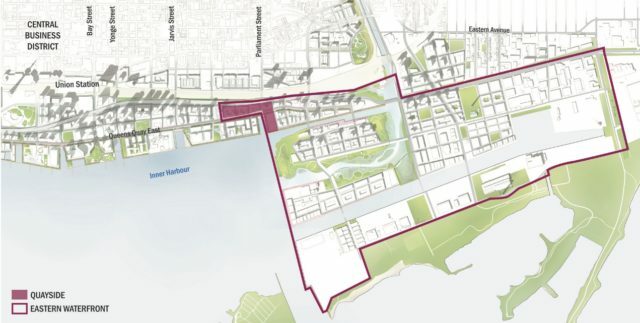 Waterfront Toronto announced last week that Google-affiliated company Sidewalk Labs won the bid to be the “innovation and funding partner” on developing the Quayside neighbourhood in Toronto’s Port Lands. Several firms are already helping advise on the work, including ARUP for urban planning and KPMG for financial planning. Important details about how this project is going to play out are not yet defined, including roles, legal relationships, and contracts about financing for building out the neighbourhood. The first thing to do is take a deep breath and read the request for proposal to understand how Waterfront Toronto is coming to the table, i.e., firmly in charge. The second thing to understand is that the largest and most historically influential set of public stakeholders on the waterfront, Waterfront for All, are already enthusiastic supporters of the idea, based on its urbanism approach. The Quayside is a small piece of a much larger parcel of land on the eastern waterfront of Toronto. The smart-city industry is a trojan horse for technology companies. They can come in under the guise of environmentalism and urbansim, saying that they’re here to help with “quality of life.” Sounds nice, but they’re here for money. There are ways to integrate the profit motive with governmental responsibilities; private sector planning firms do great work for governments all the time. But the tech sector’s broad track record in supplying IT to government is a full-on fiasco. People, cameras, sensors, and the like will feed data into Sidewalk Labs’ platform. Three of the four components of the proposed data platform (sensor data, map data, and predictive data) do not involve personal data. This data will support machine learning, the focal point of big tech companies these days. Companies that use this data care more about behavioural patterns generated by masses of people like you, in the hopes of one day being able to use that information to sell things to you or to influence your behaviour. Alphabet may be so far ahead with their interconnected platform capitalism model that opening all the raw data from the project poses no commercial risk. Platform capitalism, an idea advanced by Nick Srnicek, suggests that a significant piece of the global economy is increasingly being controlled by a small number of monopolistic firms, including Alphabet (a.k.a. Google). In this context, while it’s possible to use open data from this project to build a few apps to help do things locally, it’s impossible to compete with Alphabet on hardware, influence, interconnected platforms, and the application of learnings from aggregate data. The data analyses coming out of Sidewalk Toronto should be government information and public information too, where possible. Similarly, the products that Sidewalk Labs creates with the data it collects should perhaps be open as well, depending on what it will be used for. This is where the community of activists warning about closed algorithms can make their case. But all of this is dependant on us knowing what exactly Sidewalk Labs is doing, which we can’t, unless they want to tell us. And unlike government, we can’t make freedom of information requests to Sidewalk Labs to find out. In this new age of data dominance it’s important to talk about the role the State plays in the regulation of business activity for the public good. Government is still in charge. While it’s tempting to think we simply need more and better data to resolve our most pressing urban problems, it’s not true. The fundamental problem is one of values. Values inform political leadership. Political leadership decides how to spend money and how the private sector will participate in that spending (and taxing). That’s the work to do on inclusive cities: align spending at all levels of government to address our most pressing problems, whether that means climate change, gentrification and affordability, and so on. Throwing around words like affordability and inclusivity in projects like Quayside can be misleading and even dishonest. Tech is a distraction to this value-driven work. Unfortunately, tech’s impact has become too powerful to ignore as it bleeds into and changes civic, cultural, and democratic norms. That’s why Sidewalk Toronto is an ideal opportunity to dig in and push the envelope on community engagement and co-design of government tech. The politics and implementation of this work are on the table. Data and technology can be helpful when they support, not lead, the city-building that city governments and planners know best. This is a chance to make sure that Toronto defines the requirements of its waterfront tech, rather than Sidewalk only defining solutions that work best for them. Dan Doctoroff, head of Sidewalk Labs, is a former Bloomberg executive and ex-deputy mayor of New York City. Doctoroff has called this project “a real estate play” in comments to the Globe and Mail. Evgeny Morozov, a tech writer, is labelling this project the beginning of Blackstone Urbanism, “in homage to one of the largest financial players in the property market.” Sidewalk Toronto, he argues, is the start of a market being made to create new real estate value for investors hungry for stable and decent returns. It’s a plausible take. Many commentators have foreseen dystopia, in some form, following from this Sidewalk venture. But it’s the old and relatively boring political reality here that matters more: government designing cities with the private sector in a key position, despite the fact that it’s a job only government has the understanding and incentive to do properly. Most governments have bought into the narrative that tech innovation happens better in the private sector. But as economist Mariana Mazzucato argues, government has been at the heart of much historical innovation, and government should begin to take back the narrative about the private sector being the only innovation engine that works. “This fabricated story [that the government can’t do innovation] hurts innovation and increases inequality. And the problem goes beyond innovation. The story has been used to downsize the State through an increased number of public activities being outsourced to the more ‘dynamic and efficient’ private sector, chopping away at the very brains of the State—with fewer and fewer resources aimed at building its own internal competencies and capabilities,” writes Mazzucato in her book The Entrepreneurial State. Smart cities can be done by governments themselves, perhaps not in their entirety, but in larger part than is being imagined now. Governments are seeking more technology workers in their recruiting efforts. Governments can also invest in vendors that provide open processes and solutions. This is where cities can lead in government technology purchasing reform—using established global city forums to collaborate on common needs related to data and technology, and procuring solutions to serve all their members at a reduced cost. Collette Murphy, executive director of the Atkinson Foundation, is calling for Community Benefits to be part of project design. As the Mowat Centre describes them, “Community Benefits Agreements are a strategic tool used in the process of building community wealth. CBAs are negotiated agreements between a private or public development agent and a coalition of community-based groups.” In addition to that, the City and Waterfront Toronto could make data science and machine learning skill development for their staff a part of any ongoing work with Sidewalk Labs. It’s a good place to test the company’s appetite to develop sustainable solutions that can be expanded upon by government. Innovating in the area of tech skills development is something to work toward, and recognizing government as a technology employer is an important piece of the plan to get out of the private sector dependency that’s been normalized. The way this consultation plays out in Toronto will speak to how genuine the desire is to engage communities in co-design and support government agendas. In a follow-up piece, I’ll outline some draft ideas and opportunities for topics to raise at the first town hall on November 1 to keep the conversation going. If there has ever been a time to stress-test the rhetoric about technology versus democracy, this is it.